Responsiveness to the emotional state of another plays a fundamental role in the patient doctor relationship (PDR) as well as in other human interaction. Sympathy and empathy are not the only responses in the PDR. Other responses can be consolation, kindness, politeness,compassion, and pity. Empathy and sympathy: at first glance, the 2 concepts fit perfectly with medical practice. Clearly, these are emotions competent clinicians must know how to display; they are a part of good bedside manner. This is the first post in a series about the Patient Doctor Relationship.The next post will be on Saturday, July 19th. My point is that good bedside manners is something each doctor can and has to learn as well as sympathy when called for. Empathy is a quality not every human or doctor possesses. 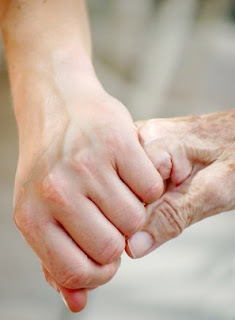 Moreover, experience and age enhance the use of empathy. Not to say that lack of experience or being young excludes the possibility for showing empathy, there are still natural talents out there. Empathy usually is part of a process such as the patient doctor relationship, psychotherapy, counseling or caring by a nurse. The difference between empathy and sympathy? As far as empathy and sympathy are concerned it is unclear whether they represent distinct phenomena or whether they reflect parallel processes that covary across situations. Empathy is an effortful process by which we try to comprehend another’s experience, while sympathy would be a direct perceptual awareness of another person’s experience akin to the phenomenon of sympathetic resonance. Sympathy does not necessarily require feeling any kind of congruent emotions on part of the observer, a detached recognition or representation that the other is in need or suffers might be sufficient. Dr. Benita Burke, skipped lunch to spend extra time with her cancer patients. They dubbed this time “mental health rounds,” during which they could address issues that were not strictly medical. Many times, Dr. Burke would wind up in tears or giving an embrace. Emotional contagion – This is when someone identifies with the strong emotions of others and tends to become subjective to the same emotions themselves. Emotional contagion however does not require that one is aware of the fact that one experiences the emotions because other people experience them, rather one experiences them primarily as one’s own emotion. With empathy there is no confusion between the feelings and needs belonging to the patient and to the doctor. Empathy is neutral, aimed at understanding the other and not about feeling for the other, empathy is unselfish, free from prejudice. Empathy to me is a valuable tool in the patient doctor relationship, but not a simple one. It costs a lot of energy, emotional energy. It usually needs at least a working alliance with a patient or other therapeutic forms of a relationship. A lot of questions remain about empathy. Is empathy a trait or a state or a combination of both? Can you teach empathy? What do you think about empathy? Let me know in the comments. I think all good Dr’s are empathetic. Unfortunately, so many either aren’t, or do not know how to show it. A couple years ago I had an appt for a physcal with my family Dr. She was away delivering a baby and a Locum was taking her place. All she needed to say to me was ” are you going to be okay? Do you have someone who will help you?…and maybe make a phone call to my pdoc. Instead she left me feeling so exposed, vulnerable and more alone for having opened up. Anyways, my pdoc is the most empathetic person I have ever met. That is the reason I connect on such a deep level with him. I know he will never judge me, always listens to both the words and the body language (the said and unsaid) and I know, that if he can, he will be there for me when I need him. I found out last week that he has been diagnosed wth MS and I am really worried about him. If he becomes to sick to practice I know I will never, ever be able to connect with anyone like I do with him. His empathy and ability to connect with me on almost a spititual level is beyond anything I could ever have hoped for or expected from my pdoc. I am most worried that I will lose that connection to someone so special. GruntDoc » Blog Archive » MedBlogs Grand Rounds 4:44 The 200th Edition! Very nice post and I believe that empathy can be taught – we teach it to our children. Clinicians also create a “culture of empathy” when we take the time to express empathy to our patients, it encourages others to do so. Treating sick people is difficult and we build up defenses – some of us use humor as a defense. If we, as clinicians, can support and encourage one another to remain empathic in our interactions with patients, everyone would be better off. Given that 85% of communication is nonverbal, empathy – or the ability to use intuition, imagination, and intimacy to connect to another’s experience — must be an essential part of a health care provider’s diagnostic (and treatment)portfolio. Can empathy be learned? Absolutely – through experience not intellectual discussion. Unfortunately, I doubt that the communication style and overall dynamics of medical training are compatible (or comfortable with)with teaching empathy. Empathy is pretty much the definition of nursing, IMO. We spend so much time with patients, it’s what they need from us. A nurse without empathy is basically a practicing technician. In a next post in this series I will discuss the topic of teaching empathy, further on this week on Friday there will be a post on self disclosure. Empathy can be taught to people, yes. Even doctors? Well, maybe. The issue is that you want to teach empathy for specific kinds of emotional states–fear, helplessness, suffering from pain, etc. These are the issues that confront most patients. These are the states that patients need empathizing with. You can teach a doctor to recognize these states. But if they’ve never felt them themselves, it will be difficult to get them to empathize. Most docs, by defn, are successful people. To get into med school, through med school, through residency, etc. requires being at the height of your game. For most folks who make it that far, it means being physically strong with good stamina, having an ability to run on little sleep, ability to maintain one’s wits about themselves, being unlikely to have an emotional outburst when tired/cranky/underfed/overworked, etc. It means precious few failures in life, few debilitating illnesses, physical or mental. it means few setbacks. But the patient needs someone who can connect with setbacks, with pain that’s debilitating or demoralizing, with fear, etc. does the doc have any such similar experiences they can call on? If the doc can recognize those signs in the patient, then they can be taught to call on their own similar experiences,and ask themselves what they needed then, how they can relate, what would have provided them power or solace or control, and then using that imagery or ideation, help provide those tools to their patient. This is different than emotional contagion because you don’t have to feel what the patient is feeling. instead, you relate it to your own experience, a feeling of your own creation. if the doc is basically emotionally healthy, then they can do this relating without it becoming overblown, all about them, etc. can a med school course teach this? I don’t know. But you could start with some pretty clear case studies: your patient is afraid. when were you last afraid? name an environment where you’d feel out of control, etc. what would have helped you? how can you apply that to the patient? I doubt it that most docs are “successful people” as you call it. It may look like it from the outside due to idealization of the doctor. Nevertheless, they are prone to misfortunes, emotional troubles, illnesses as all other human beings. I agree with you that we can teach them consolation, sympathy and even cognitive understanding of feelings but empathy is a trait not easily recognized nor utilized. they couldn’t be prone to it affecting them, or they wouldn’t have been accepted to med school. people with failures, setbacks, acute illnesses, emotional troubles, etc. that caused them to blow some tests, get a few bad grade in college, or slip in semester, or otherwise fall off the success train for a while don’t get accepted to med school. and they certainly can’t make it through med school if such personal issues affect their performance. It’s amazing Dr Shock that you showed no empathy to Aqua’s terrible experience with the locum. Why didn’t you acknowledge that in your reply? I disagree. Deeply troubled people are still capable of accomplishing amazing things. I still constantly battle the torture of poorly-controlled bipolar disorder and crippling social anxiety, and since finishing high school, I’ve had seven unrelated surgeries and a string of health problems, some typical, and some uncharacteristic of a person my age. More than once, I either thought I was dying or was actively planning my death (one such event led to a week-long stay in the psych ward). Despite all that, I managed to complete a difficult undergraduate degree as a full-time student, working 20 hours per week, and involved in multiple extracurricular activities. Looking back, I have no idea how I managed. I got out with grades and experience plenty good for med school but opted for PA school for personal reasons. I’ve had four major depressive episodes since starting school last summer (which is really no more than usual) and multiple medication changes that obviously haven’t helped much. Mental or chronic physical illness certainly makes matters exponentially more challenging, but it does not preclude a person from obtaining a professional education. I participate on my school’s Mental Health Advisory Board, which addresses the mental health needs of all of the dental, medical, nursing, PA, and allied health students. There are a lot of students who have some real troubles, both mental and physical. Your doc may have a much deeper personal understanding than you’d expect. The Culture of Empathy website is a general portal for resources and information about the values of empathy and compassion. I’ve gathered a list of over 50 experts who are studying empathy. You can see it here.